Annie Samarasinghe has it all together. Beautiful and brilliant, she has a medical career in Sydney and a fiancé in Sri Lanka. 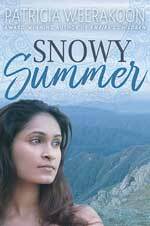 Forced to hide out in the Snowy Mountains, Annie changes her name and her story. When she meets the brusque and arrogant Roy Broughton-Knight, she discovers she's not the only one hiding secrets. But the more she gets to know Roy, the closer Sunil comes to finding her.